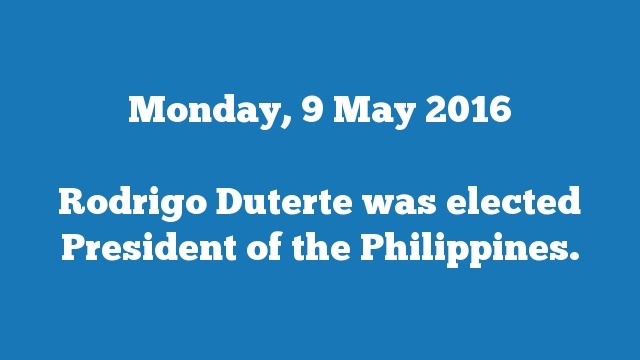 Rodrigo Duterte was elected President of the Philippines. 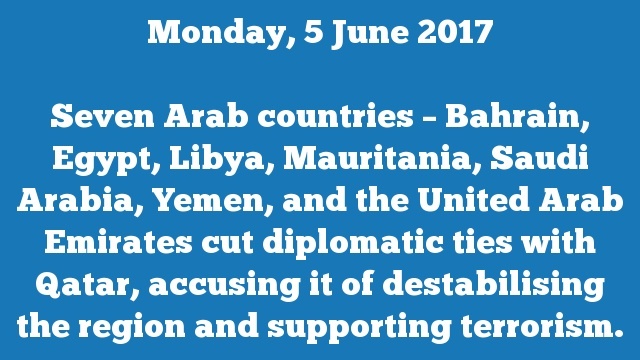 Seven Arab countries – Bahrain, Egypt, Libya, Mauritania, Saudi Arabia, Yemen, and the United Arab Emirates cut diplomatic ties with Qatar, accusing it of destabilising the region and supporting terrorism. 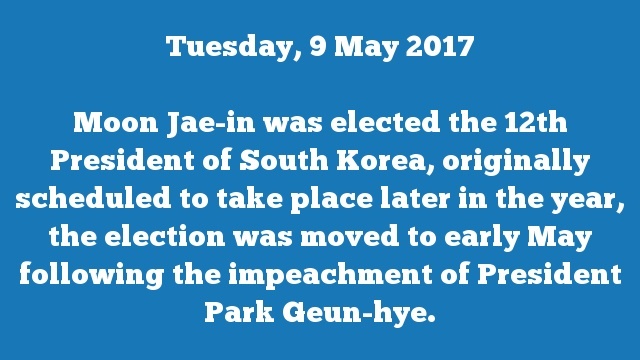 Moon Jae-in was elected the 12th President of South Korea, originally scheduled to take place later in the year, the election was moved to early May following the impeachment of President Park Geun-hye. 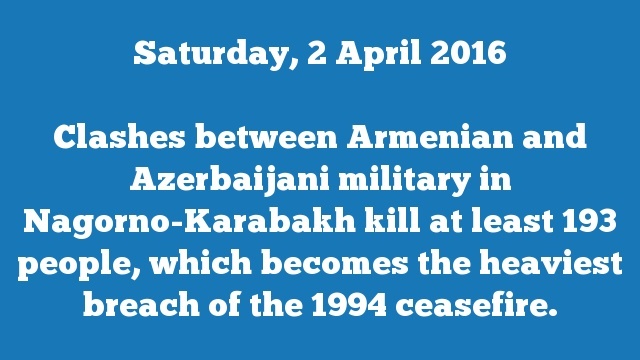 Clashes between Armenian and Azerbaijani military in Nagorno-Karabakh kill at least 193 people, which becomes the heaviest breach of the 1994 ceasefire. 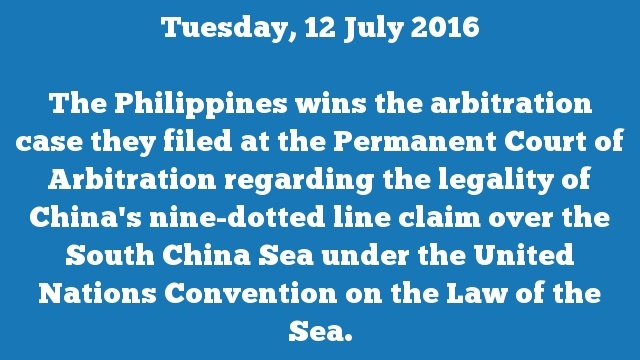 The Philippines wins the arbitration case they filed at the Permanent Court of Arbitration regarding the legality of China’s nine-dotted line claim over the South China Sea under the United Nations Convention on the Law of the Sea. 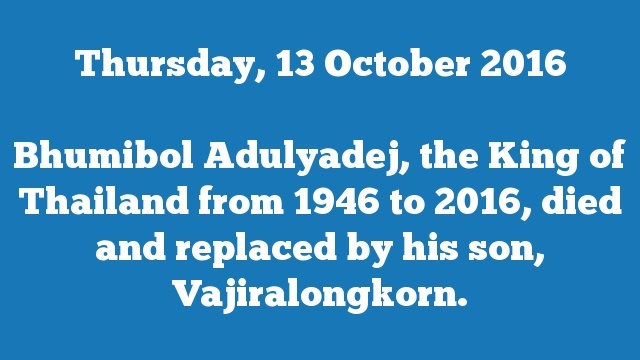 Bhumibol Adulyadej, the King of Thailand from 1946 to 2016, died and replaced by his son, Vajiralongkorn. 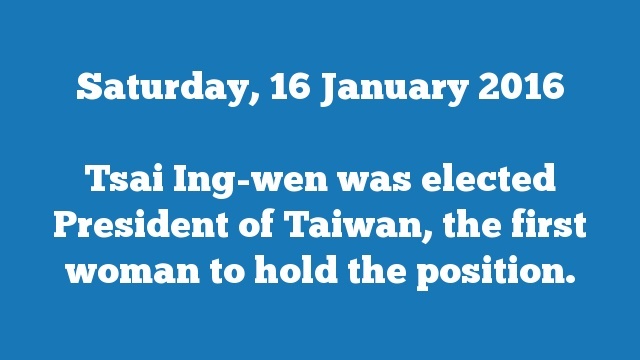 Tsai Ing-wen was elected President of Taiwan, the first woman to hold the position. Abdullah, the King of Saudi Arabia from 2005 to 2015, died and is replaced by King Salman. Thailand Prime Minister Yingluck Shinawatra is home-arrested in the wake of a military coup. 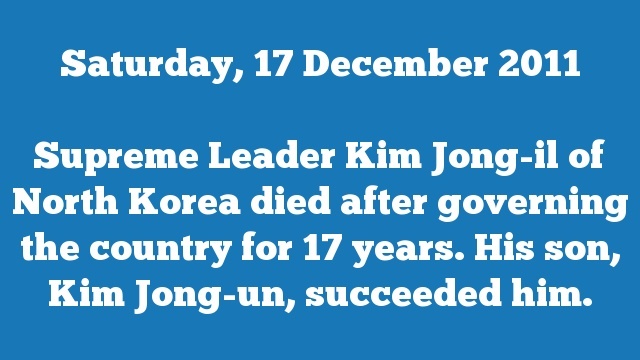 Supreme Leader Kim Jong-il of North Korea died after governing the country for 17 years. His son, Kim Jong-un, succeeded him. 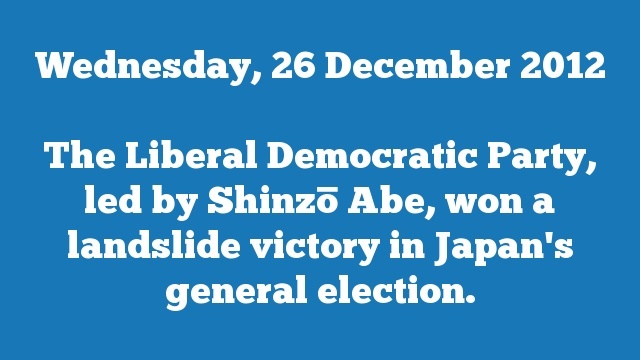 The Liberal Democratic Party, led by Shinzō Abe, won a landslide victory in Japan’s general election. Hamad bin Isa Al Khalifa, King of Bahrain, declared a three-month state of emergency as troops from the Gulf Co-operation Council were sent to quell the civil unrest.